In a biotechnological tour de force, Rice University engineering researchers this week unveiled a new method for rapidly converting simple glucose into biofuels and petrochemical substitutes. In a paper published online in Nature, Rice's team described how it reversed one of the most efficient of all metabolic pathways -- the beta oxidation cycle -- to engineer bacteria that produce biofuel at a breakneck pace. Just how fast are Rice's single-celled chemical factories? On a cell-per-cell basis, the bacteria produced the butanol, a biofuel that can be substituted for gasoline in most engines, about 10 times faster than any previously reported organism. "That's really not even a fair comparison because the other organisms used an expensive, enriched feedstock, and we used the cheapest thing you can imagine, just glucose and mineral salts," said Ramon Gonzalez, associate professor of chemical and biomolecular engineering at Rice and lead co-author of the Nature study. 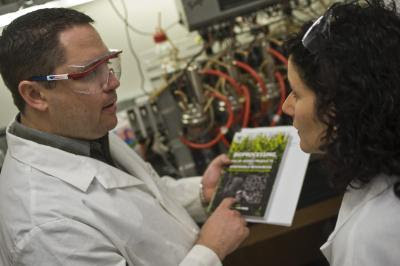 Gonzalez's laboratory is in a race with hundreds of labs around the world to find green methods for producing chemicals like butanol that have historically come from petroleum. "We call these 'drop-in' fuels and chemicals, because their structure and properties are very similar, sometimes identical, to petroleum-based products," he said. "That means they can be 'dropped in,' or substituted, for products that are produced today by the petrochemical industry."